This is the story of Millo Castro Zaladarriaga, a young Cuban girl who wanted desperately to play the drums, but she lived in a time when only boys were allowed to play them. That didn't stop Millo from dreaming, and eventually she became the first girl to crash through that barrier, one day having the honor of playing with some American jazz greats, as well as for President Franklin D. Roosevelt. Drum Dream Girl is a gorgeous poem that celebrates the power of a passion, which is paired beautifully with Rafael Lopez's vibrant, dreamlike illustrations. The magical realism of the illustrations evokes an emotional, empathic connection to the Cuban culture beyond the political narrative so many Americans are used to seeing and reading about. 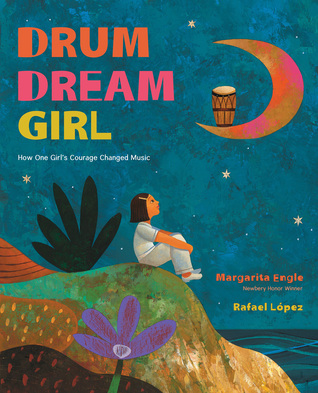 Drum Dream Girl is one of many Margarita Engle books that help to educate and remind us that Cuba is a country of people with hopes, dreams, and fears like we all are. This book, paired with Engle's upcoming memoir, Enchanted Air, has given me the itch to someday travel to this once verboten country. Thank you for sharing this! Margarita Engle's writing is so beautiful--I cannot wait to read this one!